Back when Aretha Franklin was still in her (very late) twenties, I saw my first black gospel choir. It was at Ronnie Scott’s famous jazz club in London’s West End where I was lucky enough to have a free pass. If that sounds too good to be true, I also qualified for a free bar tab, such were the perks of being a press officer at CBS. The downside was that I developed pancreatitis ten years later, meaning I could never drink again. “One drink and you’re dead”, said the doctor, when I emerged from six weeks in intensive care. Perhaps that was a good thing. 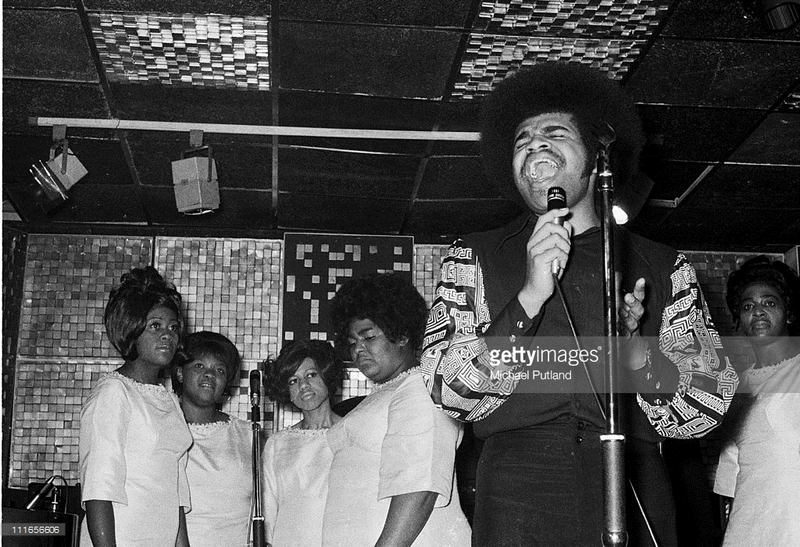 The Edwin Hawkins Singers at Ronnie Scott’s in 1970. Courtesy: Getty Images. The choir at Ronnie Scott’s was America’s Edwin Hawkins Singers who had enjoyed international success with their gospel arrangement of the eighteenth century hymn, “Oh Happy Day”. It reached number two in the UK and number four on the US singles chart in 1969. I remember the Singers being about 30 or 40 strong and overflowing off the stage, almost into the audience. Naturally, they were brilliant, but even more so when they sang their instantly recognisable hit single. I believe the Edwin Hawkins Singers even had another foray into the singles charts when they backed the US folk-pop singer Melanie on her international hit, “Lay Down (Candles In The Rain)” a year later. About ten year later, I stumbled across a vintage book in a North London jumble sale called The Story of The Jubilee Singers, an earlier all-black choir, about 100 years before the Edwin Hawkins Singers, who had taken Britain and Europe by storm in 1873. I snapped it up and read it fervently in the hope it might somehow give me a clue to how blues was born. 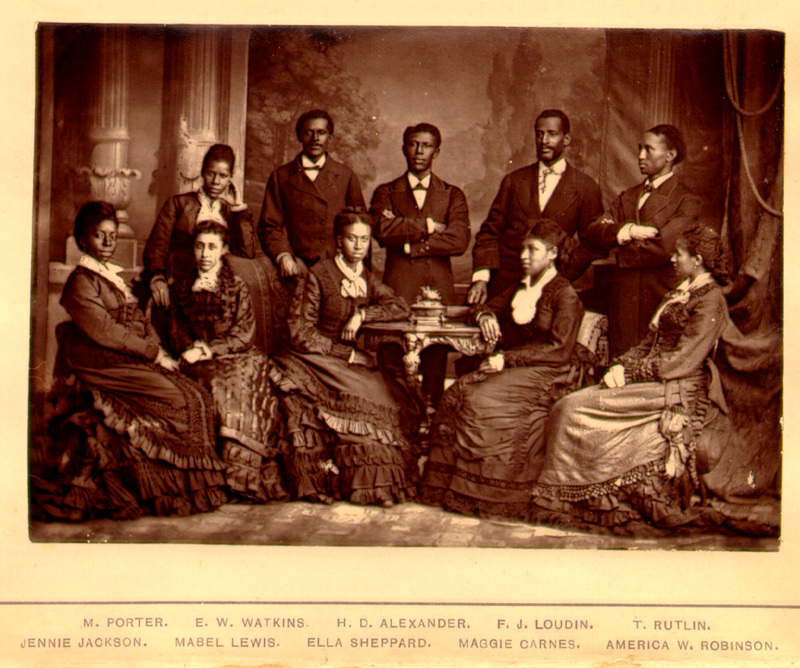 The Jubilee Singers photographed in 1877. Unfortunately it didn’t enlighten me on that score, but I did discover the choir belonged to Fisk University. If you didn’t know, Fisk was America’s first black university, founded in Nashville, Tennessee, in 1866, just six months after the end of the American Civil War. Its remit was to educate freemen, as former slaves were known, and enrolment jumped from 200 to over 900 within the first few months of operation. Students were aged from seven to 70. The name came from Clinton B. Fisk, a colonel in the Union Army who made unused barracks available to the school. He also established the first free schools for white and black children in Tennessee and endowed Fisk University with a total of $30,000. Hey, I’ve got that book. Wanting to find out why my vintage book was brown and not green or blue, I’ve just been researching it online, and discovered I’m the proud owner of an 1881 first edition, according to a 2008 website selling one similar for $58. It’s probably worth double that now. Not bad for a £5 investment. What fascinated me was how the choir were feted and entertained by crowned heads of Europe including Queen Victoria. So taken was Queen Victoria with the Jubilee Singers’ beautiful voices she said they just had to be from the Music City of the United States. And that, folks, is how the term ‘Nashville, Tennessee, Music City, USA’ is said to have originally come about. And so to the point of this preamble. The other day I had a leaflet thrust into my hand advertising a Free Recital of Gospel, Classic, Folk and Sacred Music at Southwark Cathedral next to London Bridge. With my interest in gospel choirs stoked by choirs like the Edwin Hawkins and Jubilee Singers, I thought I’d give it a go. The recital was by America’s Festival Chorale Oregon, so what better than a bit of American gospel on a warm Thursday afternoon? 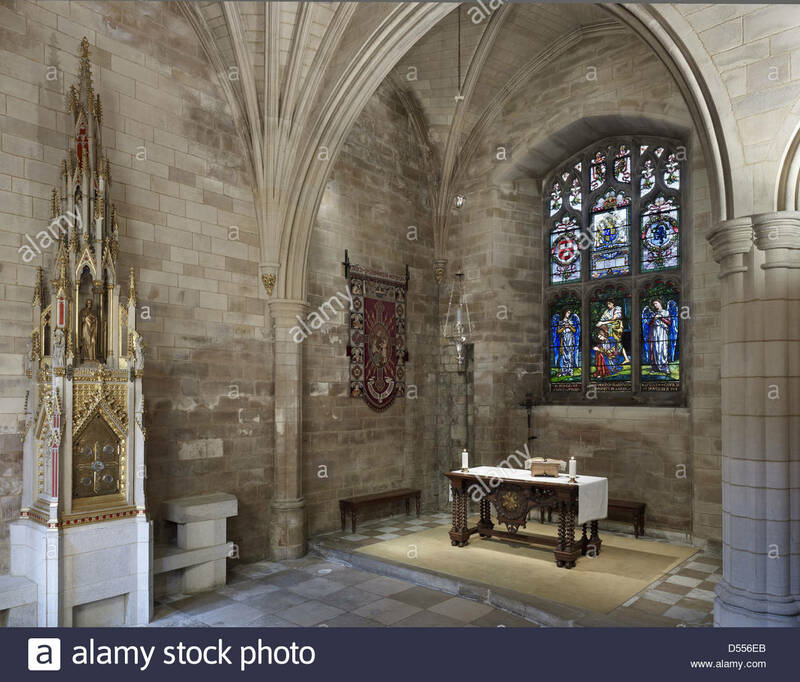 The Harvard Chapel in Southwark cathedral. So off we went to Southwark Cathedral, the base of which dates back to 1220. Americans might be interested to know that John Harvard, founder of your famous university in Cambridge, Massachusetts, was baptised there in 1607. Harvard’s father, Robert, was a local London butcher and inn-holder, and business associate of William Shakespeare. There’s a Harvard Chapel in the cathedral paid for by Harvard alumni living in England. I was, of course, expecting a black choir, but Festival Chorale Oregon, surprisingly, turned out to be mainly white, and that wasn’t just the hair colour crowning half their heads. Not that this mattered, because their combined voices were as pure as the winter snow that surely banks up in the Willamette Valley, near the choir’s home town of Salem, Oregon. Hey, some of the singers looked like they were knocking 70 – no offence girls. But they were superb and gave London a lesson in American music, from the eighteenth century compositions of the first wholly-American composer, William Billings, through Shaker and Appalachian songs, to secular Americana and traditional spirituals like, ’Way Over in Beulah Lan’. One tune we didn’t expect to hear was the old camp meeting song, ‘As I Went Down To The River To Pray, which I have on an album by the American bluegrass singer, Alison Krauss. It’s attributed to George H. Allan in the Slave Songbook of 1867 but some believe it was adapted from a Native American tribal song. I first became aware of Alison Krauss through her collaboration with Robert Plant which saw the pair win five Grammys in 2007 including album of the year. Only now have I discovered that, with Quincy Jones, Alison is the most awarded living Grammy winner in history, with 27 Grammys from 41 nominations. You live and learn. I’ve also just learnt that I shouldn’t have been surprised at the quality of the Festival Chorale Oregon’s singing. It turns out they’ve toured Europe five times, performed at the Lincoln Centre in New York, toured the United States endlessly, and appeared another five times in Carnegie Hall. And the fact their performance was free made last Thursday, oh, a particularly happy day.